and posted the videos on YouTube. Not the best layout. In portrait orientation it's illegible. Why isn't the type larger. It's really hard to use your finger to click on links this small. This was taken with the Samsung Moment's camera. This is not the best layout to use with a mobile site. In portrait orientation it's illegible. The type is so small you have to enlarge the content before you can click on a link with your finger. This is on the iPod Touch 3G, photographed with the Samsung Moment's camera. Some PP in Fireworks. But in a year, I'll probably want an upgraded Android phone. Besides the physical keyboard, the Moment has a faster processor than the Hero (800 vs 528 MHz). This is even after Best Buy dropped the price of the Hero from $180 to $100. This is probably in reaction to Verizon Wireless' $100 HTC Droid Eris, which is very similar to the Hero. Bth run Android 1.5 (Cupcake). The Motorola Droid runs the newer Android 2.0 (Eclair), which goes for $200. I'm using both these days, having solved the problem of sync'ing data among these two and my laptop. Gizmodo posts this tongue-in-cheek article: Giz Explains: Android, and How It Will Take Over the World. Verizon Wireless has certainly boosted the recognition of the Android mobile phone OS supported by Google and the Open Handset Alliance with their current ad campaign for their Motorola Droid smart phone. For some reason they're branding this phone as evil. I guess to upset the iPhone applecart in a hurry. The TV commercials show space-age bombers deploying bomb-like metal containers across America's heartland (where AT&T's coverage just so happens to be weak?). The containers hit the soft dirt with explosive force, scaring horses and children alike, then a metal leaf shutter opens revealing the evil intruder with the ominous red eye. It makes HAL look like avuncular. Their prior commercials have been very aggressive against AT&T's network shortcoming, prompting AT&T to take legal action. Regarding the Giz article, it points out that while the basic Android OS is open source, it can also include propriety apps and extensions that don't have to be shared with the open source community. 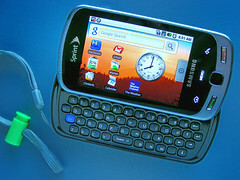 With the first Android phone on Sprint, the Hero (Android 1.5 aka Cupcake), HTC implemented a form of multi-touch, but could only do so on the open source portions of the OS, the browser for one. Google apps such as Google Earth and Map don't have the HTC multi-touch hack because they're proprietary. Some speculate that this an agreement by Google not to compete with Apple's multi-touch on the iPhone and the iPod Touch. Palm decided not to play nice, and added multi-touch to the Pre, as well as using Apple's iTunes to sync the phone with your PC. Apple fixed that with an update to iTunes. And, if you make your own Android phone, you'd better not use Google's apps, "like when Android modder Cyanogen had to strip the apps out of his custom Android builds to avoid getting sued by Google." Having tried the HTC multi-touch, I didn't like it, and it doesn't work as well as Apple's. It's hard to get the right sizing. When you think you have it right, it snaps to a different magnification. This makes it very hard to fill the screen with a particular column on a Web site. With the Apple multi-touch, a double tap just seems to do the trick. Competition is always a good thing, so is free stuff such as Google's turn-by-turn voice navigation supported by their Android 2.0 release aka Eclair, unless you're Garmin or Tom Tom whose stocks have recently taken a hit. There will be more hardware devices running Android, that's expected, but that's also the problem. With various manufacturers producing devices with different screen sizes and resolutions, plus adding their own proprietary extensions, the Android mobile phone experience will be inconsistent, and the brand could suffer. Apple has the advantage of having close control over the hardware. The iPod Touch 3G I'm using now is unsurpassed in the way software is integrated with the device. Everything flows, with no clunky menus or hacks. The Web browsing experience is the best, as well as playing media. Well, that is if you don't include Flash, as that war is raging between Apple and Adobe. Flash also is building a bad reputation because of Web sites that are serving up ads you have to suffer through before you get the content you expected. Also, Flash has security risks, including the troublesome use of Flash cookies. Some are saying there should be open standard for vector graphic media and compressed video. I think Apple wants to stick by QuickTime. This all means that change is picking up in pace. The smart phone you buy today will probably look very indequate a year from now. The next wave coming will be in speech recognition. I've already been amazed by Google's Voice Search on the HTC Hero phone I had tested. Speech recognition will be the killer app for mobiles, IMHO. It will take a beefed up processor on your phone to support this. Right now, they use a back end solution where Google's servers do the processing. What's unshakeable is the Web's movement towards the mobile platform, and Google will be there. He thinks this is the best Motorola phone, the best Verizon smart phone, and the best hardware he's tested that runs Android. It runs Android Eclair (2.0). He says that this version adds voice-prompted turn-by-turn navigation. Actually both the HTC Hero and the Samsung Moment offer Sprint's navigation app which work well with both phones according to my tests. Its screen is sharper and larger than the iPhone's. No multi-touch. Actually the HTC Hero uses a multi-touch function sitting on top of the Android. I didn't like it at all. It was very jittery, and hard to get the right sizing. The Samsung Moment doesn't have multi-touch in any form but uses zoom icons, and they work much better. The keyboard has, in his opinion, "flat, cramped keys that induce too many typing errors, yet lacks auto-correction." This sounds like the keyboard on the Moment, which I'm falling out of love with. I can type faster on the Treo keyboard. The Android platform only has 3 panels for displaying app icons in contrast to the iPhone's 11. UPDATE: Another article in today's WSJ "BlackBerry Offers Low-Hanging Fruit" suggests the that BlackBerry will take the hit with the rising smart phone competition provided by the new crop of Androids. Third quarter estimates put the global smart phone market share for RIM at 20%, while Apple sits at 17%. Nokia is at approx. 38% according to Strategic Analytics. The article speculates that the BlackBerry may become "the AOL of the mobile device market." This might a little over dramatic. Apple is leading the price war with their $99 iPhone. I'm sure you'll seen an Android soon similarly priced. I picked up this Samsung Moment at Best Buy yesterday, the first day of its release from Sprint. The phone was activated and the EVDO service was provisioned in minutes. It took around 5 minutes for my Google contacts to sync. It has no software to sync with your PC. Everything is done over the air (OTA). 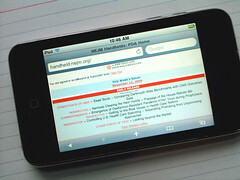 I installed Unbound Medicine's Harrison's Manual of Medicine OTA from their Web site. But it's easy enough to attach the phone to a USB port and mount the 2GB microSD card that comes with the phone. Supposedly it will support up to 32GB.